Interesting idea - can anyone find a non-BBM photo of Heath where he has an Ennis look about him. I'm roving through my mental collection and I can't think of any. I can remember some moments in films where he says, "Hunh," or does the little head shake, but not where he reallly looks like Ennis. Can anyone come up with one? Actually, I have one that comes sort of close. 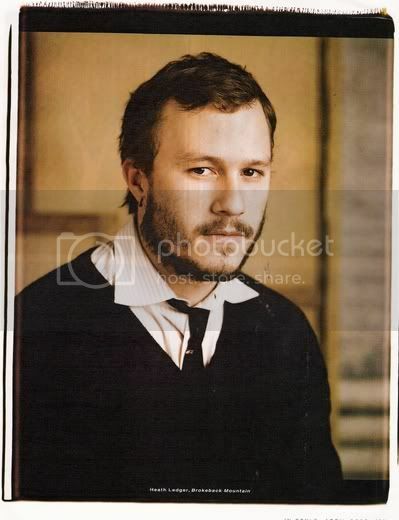 It's a fairly recent picture of Heath from a magazine, and you can almost see Ennis in him. If I can master this newfangled computer gizmo and figure out how to upload it, I'll post it. I've come on some pics lately, in which Heath reminds me of Ennis. But now, when I was specifically looking for them, I didn't find. It's late now and I gotta go to bed. Will be looking for more tomorrow (another excuse to surf Heath pics ). I must say, in every picture of Heath I see an energy below the surface I don't see in Ennis. Ennis doesn't have it. Mmmm. Talent and hard work -- works every time. Did it work? This is my first attempt at photo posting. Whoops, sorry it's so huge. Still learning. I see your 5% Ennis as the most Ennissy of all of them -- maybe it's just the twisty mouth. But that mouth.... I think it's THE feature with which Heath expresses Ennis: everything he would say but can't gets stopped up behind those tight lips, that clenched jaw. Ditto for me. In fact, age aside I would almost put Lucise's pix in reverse order of Ennisinity (not counting the 100% one). The first one could be Ennis at 17, but the others are someone else entirely.